Scars can result from many different kinds of injuries and health problems. Burns, whether caused by fire, heat, chemicals, radiation or electricity can cause great damage to the skin. Cuts, surgical incisions impact wounds, such as might be sustained in a car accident also leave scars. Even chicken pox and teenage acne can leave pits and depressions in the skin of the face. Common scars in women are the stretch marks that develop during pregnancy. Scars are the result of the skin healing itself. It can never heal perfectly, so that the skin is as smooth and supple as before and many people are distressed because they think that their scars are unsightly. It is common for people to see if their scar can be removed or made less obvious but because this is a cosmetic procedure, it usually has to be done privately rather than under the National Health Service. The NHS will carry out scar treatments but usually only in cases when the scar has caused serious problems. Some burn victims, for example, find that their scars severely limit the movement of limbs or the head because the skin contracts when it heals, pulling on the surrounding tissues. Most private hospitals will carry out scar treatment using lasers on an out-patient basis. You need to attend the appointment for the treatment, but you will then go home rather than staying in hospital. Most treatments are carried out under local anaesthetic but you might have some mild sedation or occasionally heavier sedation or a general anaesthetic so it is best to get someone to drive you home and stay with you to make sure you are OK. Some types of laser burn off the surface of the skin in the region of the scar to allow the dermis underneath to grow. The new surface skin is usually smoother and more even in tone. Other types of laser work on the layers beneath the skin, causing damage to the dermis to stimulate skin cell division. These lasers do not damage the epidermis of the skin, the very outer layer, so the skin does not peel afterwards and recovering is much quicker. Vascular lasers can be used to treat stretch marks. The marks will not disappear but laser treatment can turn the marks from the angry red colour to the silvery white of mature stretch marks within a year. Usually stretch marks remain red for 4 or 5 times as long as this. Chemicals can be applied to the skin, particularly to the face, to renew the skin’s surface and lessen the appearance of acne scars and chicken pox scars. Dermabrasion achieves the same effect but using a different technique. Instead of applying a chemical to the skin, an abrasive tool is used by a skilled operator to actually rub away the skin’s surface layers. This can be painful and needs to be done with a local anaesthetic and sedation. Both methods result in peeling of the surface skin, soreness and redness, which can last for several weeks. 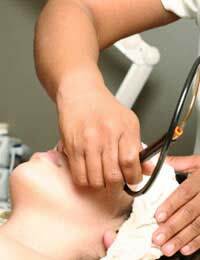 For small scars, such as deep acne pits, a punching tool can be used to extract a plug of skin at the position of the scar. The skin all around regrows and usually fills in the original pit. There is still a scar, but it is far less noticeable. Major scars, such as those that arise from extensive burns, need complex plastic surgery to try to rebuild the tissues with skin grafts to help restore as much function as possible. Skin grafts are a specialised scar treatment and, along with microsurgery, tissue expansion and other associated reconstructive surgeries, are usually only offered by some private hospitals in the UK, some only in London. There are many different scar treatments available in the private healthcare system and the price varies from centre to centre and depends on the procedure. Typically, a course of laser skin resurfacing costs around £1000; a chemical peel will be less than that, a course of punch treatments for deep acne pits will probably cost more and the cost of major surgery to treat burn scars could be more than £10 000, which would be prohibitive for most people without private medical insurance (that comes with a job package, for example). This work is more likely to be available on the NHS, however, because of the medical necessity of the treatment.